People resist climate information for varying reasons. Start by understanding your audience. A confession. 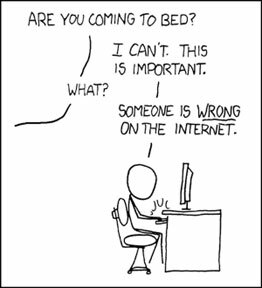 That cartoon where someone is hunched over the computer, unable to tear away from furious typing, because someone is wrong on the internet? That was me. Or at least it used to be. I’ve since calmed down a bit and learned to be more strategic in my climate change debunking efforts. In the age of bots, trolls, and sycophants, one has to pace oneself. After several years of reading, responding to, and cataloging the discourse around climate change, I now see a pattern becoming clear: Not every person offering pushback is doing so for the same reason. Sure, some people are itching for a fight, but myriad others have genuine questions, hold only tentative beliefs, or are in-sync with the mainstream science but not inclined to do anything about it. Gauging someone else’s underlying position can help focus one’s attention on whether – and how – to engage. See note at the end of this posting for a detailed description of each. Informed but idle: Best bang for the buck? Motivate like-minded peers. It’s a given that a certain fraction of the public will not change their minds, regardless of how much evidence piles up. A more productive angle is to engage those who are less certain – the three groups on the left side of the spectrum, between 9 and 12 o’clock. “For climate communicators, the ‘informed but idle’ is arguably the most important group,” says Skeptical Science founder John Cook, now a research assistant professor at George Mason University’s Center for Climate Change Communication. “Polls show 51 percent of the U.S. population is alarmed or concerned about climate change, but most of them don’t talk about climate change with their friends and family,” Cook says. Give-and-take exchanges can make better headway when they simply skip the flame wars and serve as a sharing of views between peers. “Activating and empowering these groups is one of the most productive things we can do to achieve social momentum on climate change,” Cook says. Scott Mandia, who teaches climate science and meteorology at Suffolk County Community College in New York, is a champion for science communication and a co-founder of the Climate Science Legal Defense Fund to help scientists contend with organized efforts to undermine their work. Uninformed: Reach out to the uninformed. Despite years of efforts to inform the public about climate change, some people still don’t care enough to come to grips with the issue. Those are people climate change communicator Susan Joy Hassol would love to reach. The head of the climate change outreach effort Climate Communication, a nonprofit that helps climate scientists broaden their audiences and engage them in the issue, Hassol helps scientists refine their messaging on climate change. Misinformed: Correct misinformation … politely. There may be no shortage of those deliberately spreading false information, but others may have unwittingly latched onto information that is simply incorrect. An easy way to tell the difference is to open the dialog with a question. “Good communication is a conversation, rather than a lecture,” Hassol says. But be careful not to turn an opportunity to share good information into a needless fight. Acknowledge the value of the person’s concerns, then offer a friendly, down-to-earth answer. Kudos for a response that revolves around a topic of real interest to your audience. In many conversations – whether online or face-to-face – bystanders may be observing the interplay. Not only are they listening to the content of the conversation, but also to the tone and the way people conduct themselves. Respectful, fact-based dialog may lead to a positive outcome for those on the edges of the conversation. Ideologue: Avoid trolls. Take a ‘side door’ with ideologues. Some people are resolutely immovable, but they may also take pleasure in hurling insults for each response they hear. That’s a troll’s raison d’etre. The way to deal with trolls is simple: ignore them and deprive them the attention they crave. “Remember, the atmosphere doesn’t care what people believe, it responds to emissions,” Hassol adds. Despite the urge to go head-on with an ideologue, doing so may cause more harm than good. “The odds of convincing someone who rejects the science of climate change are very slim – we can expend a great deal of energy which will most likely result in the person’s doubling down on their science denial,” Cook says. An unfortunate consequence of our divisive political climate is the portrayal of an immovable chasm between people on opposite sides of issues. While that’s certainly true in some cases, there is middle ground to be worked. Those keen to help move the needle of public opinion and engagement on climate change should look first toward peers and those who are open to change but not yet involved in the issue. 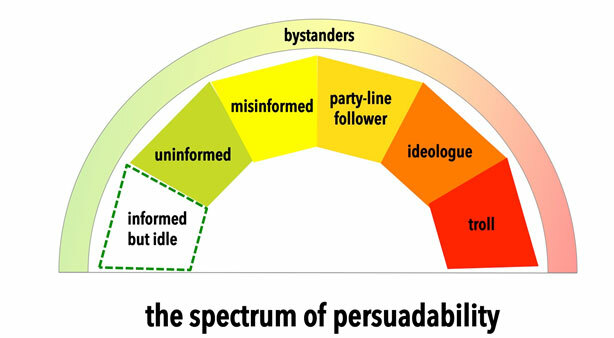 A wide range of people are listening and reading, but not engaging directly in the discussion. While it’s nigh impossible to change the mind of an entrenched ideologue, it is likely that bystanders are honestly observing and evaluating the whole conversation. This segment of the population accepts the science of human-caused climate change but makes little effort to engage with the topic. Climate change and environmental topics rank low on their list of priorities. Or, they are concerned about the climate but are uncertain how to translate that into meaningful action. These people may hold simplistic ideas about the way the Earth system works. They say things like, “Aren’t we moving closer to the Sun, or something?” It can be hard to distinguish people who genuinely don’t know much about the issue from people who are deliberately sowing doubt. Recites talking points, but without much weight behind them. Hasn’t put much thought into the issue, and defaults to believing and parroting the narrative that has been offered by political/cultural personalities. May rely on emotion rather than understanding of the topic. Example sentiments are often easily rebutted, like clean energy is too expensive, or humans are too insignificant to affect the climate. Uses deeply researched positions emanating from hardline partisan blogs. These folks have rebuttals to rebuttals and will debate point-by-point to no end. Sometimes they will delve deeply into science, sometimes economics, but either way, they will jump into great detail and argue with unending enthusiasm. Someone who is here more for the battle than for the actual subject matter. Easily identified by purposefully incendiary language, like “typical liberal” or “so-called scientists.” Frequently relies on memes. Often light on content (although not completely devoid of it) and heavy on vitriol. Ready to talk to your peers about climate change? Here are two helpful guides.